925 Silver Anchor bangle made with 4mm braided Silver and black Zircon stones. The detailed craftmanship is stunning. Bangle has magnetic clasp. 925 Silver Infinity bangle made with 4mm braided Silver and black Zircon stones. 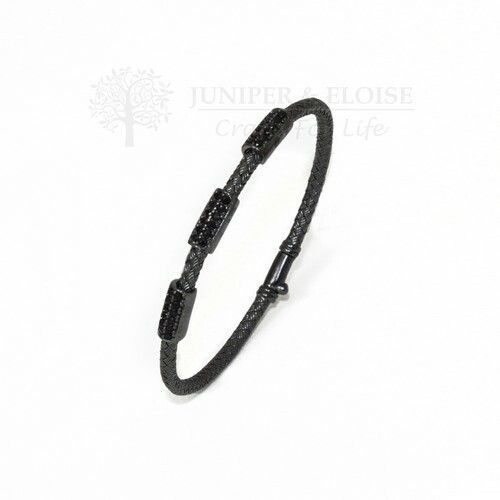 The detailed craftm..
925 Silver bangle made with 4mm braided Silver and black Zircon stones. The detailed craftmanship is..
Rose gold plated 925 Silver Dragon Claws bangle made with 4mm braided Silver and black Zircon stones..
925 Silver Arrow bangle made with 4mm braided Silver and black Zircon stones. The detailed craftmans..
Rose Gold plated 925 Silver Lion bangle made with 4mm braided Silver. The detailed craftmanship is s..